Ann Neurol. 2016 Nov;80(5):730-740. doi: 10.1002/ana.24780. Epub 2016 Oct 19. In observational epidemiologic studies, higher plasma high-density lipoprotein cholesterol (HDL-C) has been associated with increased risk of intracerebral hemorrhage (ICH). DNA sequence variants that decrease cholesteryl ester transfer protein (CETP) gene activity increase plasma HDL-C; as such, medicines that inhibit CETP and raise HDL-C are in clinical development. Here, we test the hypothesis that CETP DNA sequence variants associated with higher HDL-C also increase risk for ICH. Methods: We performed 2 candidate-gene analyses of CETP. First, we tested individual CETP variants in a discovery cohort of 1,149 ICH cases and 1,238 controls from 3 studies, followed by replication in 1,625 cases and 1,845 controls from 5 studies. Second, we constructed a genetic risk score comprised of 7 independent variants at the CETP locus and tested this score for association with HDL-C as well as ICH risk. Results: Twelve variants within CETP demonstrated nominal association with ICH, with the strongest association at the rs173539 locus (odds ratio [OR]51.25, standard error [SE]50.06, p56.031024) with no heterogeneity across studies (I250%). This association was replicated in patients of European ancestry (p50.03). 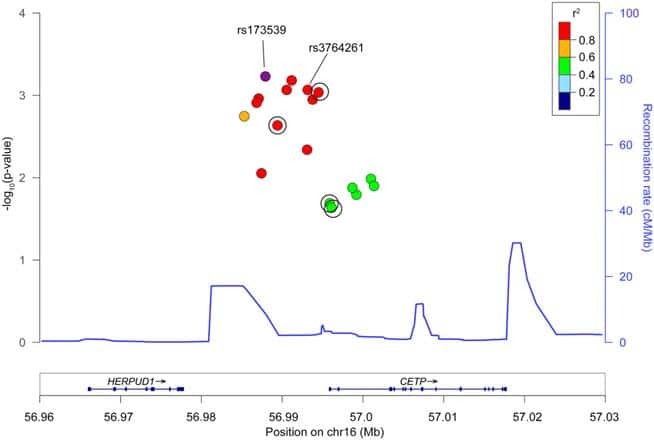 A genetic score of CETP variants found to increase HDL-C by _2.85mg/dl in the Global Lipids Genetics Consortium was strongly associated with ICH risk (OR51.86, SE50.13, p51.3931026). Interpretation: Genetic variants in CETP associated with increased HDL-C raise the risk of ICH. Given ongoing therapeutic development in CETP inhibition and other HDL-raising strategies, further exploration of potential adverse cerebrovascular outcomes may be warranted.